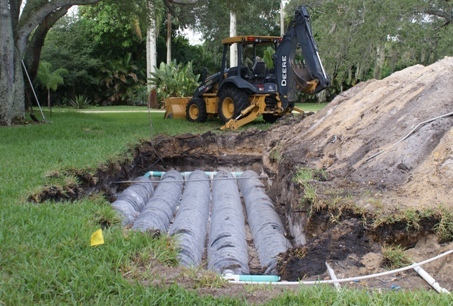 If you believe that you might have a problem with your home’s septic drainfield then you should contact us immediately for your FREE ESTIMATE to ensure the important septic issue is repaired in a cost efficient and timely manner. Our septic professionals will quickly diagnose the problem and will have your drainfield back up and running at a price you can afford. As water is used in your home, partially treated water otherwise known as “effluent” is displaced into the drain field from your home septic system. The drainfield is an underground space which allows the runoff water to accumulate and then dissolve down into the soil for final treatment. The water will then eventually make its way back to the water table. The final treatment and disposal of septic tank runoff is into the soil below your home's drainfield. Once the effluent passes into the soil, it is treated by the soil. This is why it is very important to have an experienced contractor to install the system in a safe and proper way. The logistics of each home’s drainfield depends highly on the amount of wastewater flow that each family accumulates and what each home’s outside soil consists of. This is an extremely important matter to any family’s home and to prevent flooding. All drainfields are required to have their own designated replacement area and are designed specifically for each home. At All County Septic and Plumbing we understand that you may have many questions, our highly trained and knowledgeable staff will help you navigate through the process of repairing or replacing your drainfield. Please call for your FREE ESTIMATE NOW.